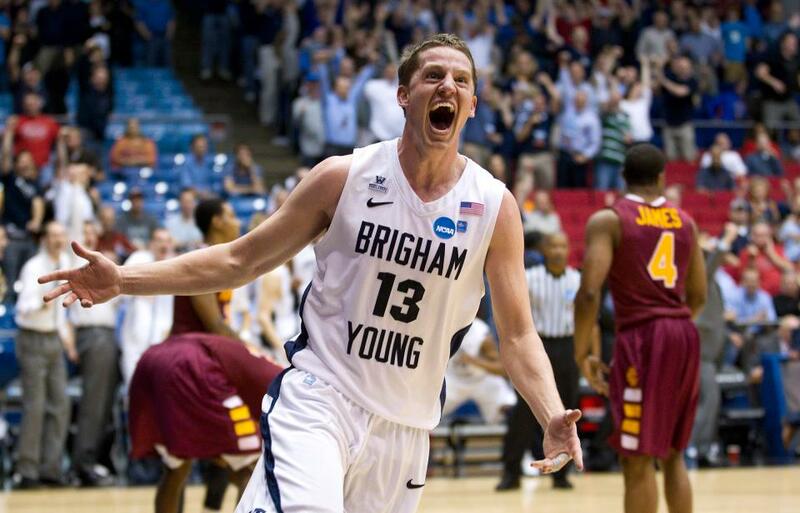 BYU Sports According to Tasha: Biggest Comeback in NCAA Tourney History & Best Game of the Season!!! Biggest Comeback in NCAA Tourney History & Best Game of the Season!!! I downloaded this picture from the web. It's everywhere today. Love it. Way to go, Cougs! Holy moley. There were lots of one-word text messages and screams echoing through the evening air last night: "Unbelievable." "Amazing." "Speechless." Trust me, I can hardly believe it either. I'll admit it-- I didn't even have the Cougs picked to make it past the play-in game. Even though Iona didn't play any top-25 teams this year and had a few bad losses, they are still the highest scoring team in the country, and I figured that, especially with Hartsock still not 100%, we wouldn't be able to keep up. I thought for sure my fears were confirmed after the first 15 minutes of the game. The Cougars were totally getting run into the ground. Down by 25 freaking points. I was already mentally planning my "I told you so" post. But then they fought back and pulled off the biggest comeback in NCAA tourney history. It rarely feels this good to be proven wrong. I watched the game with a group of about 20 people from my ward. When BYU started to come back and hope was back on the horizon, Amanda started secretly recording a video of us on her laptop. We watched the video after the game was over, and it was hilarious. My favorite part was Matt. He started out in a football-player crouch, poised and ready to spring at the sign of any movement (in the score, of course). Just a few minutes later, he was down on all fours in front of the screen, staring it down and repeatedly kicking his toes into the floor about as fast as a hummingbird's wings (don't worry-- it was a very manly hummingbird). When Zylstra made a layup for a 3-point play to seal the deal, the video footage suddenly turned into a huge blurry mass of people, running around the room, screaming, hugging, high-fiveing, and jumping higher than I thought the ceiling would allow. It was a fantastic moment. As much as I like Matt Carlino and think he has a lot of potential, he just didn't have his head on straight last night. On the other hand, Craig Cusick is the man! It's not very often that a player who saves the game scores ZERO points, but it definitely happened last night. Matt needs to have a good, long, hard look at the footage of Craig from last night to learn how to handle the full-court press and defend accurately without making dumb, freshman mistakes. Long-range jump passes into enemy territory and having a panic attack every time he's forced to dribble the ball under pressure just won't cut it in the big leagues. Craig, on the other hand, was cool, calm, collected, and almost single-handedly prevented Iona from scoring for 7 minutes straight, enabling the Cougars' comeback. I've also got to give props to Noah. He played through the pain and was the leading scorer of the night, hitting several shots when they really counted, including the 3-pointer that put us ahead for the first time with about 2 minutes left in the game. I cringed every time Brandon missed a free-throw (that would have been monumentally sucky if we had lost because of that), but he made two in the very end, when it counted most. Way to go, B. Matt also had some smart plays near the end that helped redeem his mistakes from the first half at least a little bit, and rarely used Harrison had some impressive minutes. My roommate Allyson told me that she saw someone post something like this on Facebook after the first half: "It would have been nice if the Cougars had shown up to play. Way to blow it. I'm turning this off and going to bed." It was soon followed up with dozens of comments to the tune of: "NOOO! WAKE UP!!! TURN IT BACK ON!!!" I talked to my mom after the game, and she said she watched most of the first half, but then turned it off because she thought for sure they were going to lose. She told me she was writing in her journal and wrote something like: "I watched part of BYU's NCAA tournament game. Unfortunately, they lost to Iona." But then she turned the TV back on midway through the second half and saw that they were making a comeback. After the game, she crossed out what she had written and replaced it with: "NO!!! THEY WON!!!" hahaha. Love it. Man, oh man! We were disgusted, revolted, and disappointed for the first half, and yet we forced ourselves to keep watching. I'm a blue-goggled BYU homer, so I always hold a little bit of hope that BYU will come from behind to win a game. I'm so happy my homerism paid off Tuesday night! I'm glad it did, too!